AMC's Best Sea Kayaking in New England, by Michael Daugherty, 2016. 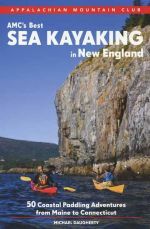 Written by a Registered Maine Guide and certified sea kayaking instructor, this guide features 50 of the best sea kayaking adventures from Maine's Bold Coast to the mouth of the Connecticut River, from remote islands to paddles closer to Boston and New York City.. For each trip there is a detailed route description and map, plus info on access and launch points, camping, tides and currents, weather, scenery and wildlife. Also includes a selection of nature and history essays. 352 pp, 6” x 9”.